While most of us can't live in Vienna, there's nothing to prevent us from taking a trip to the city that consistently ranks for its quality of life. Dozens of intimate venues -often small churches - host classical music concerts, many paying homage to Vienna's own child prodigy, Wolfgang Amadeus Mozart. 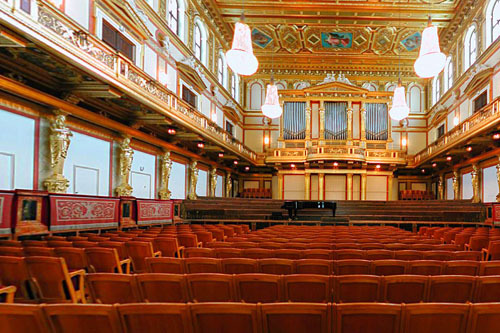 The city's Musikverein has five concert halls, the Goldener Saal being the most lavish in all its baroque glory. 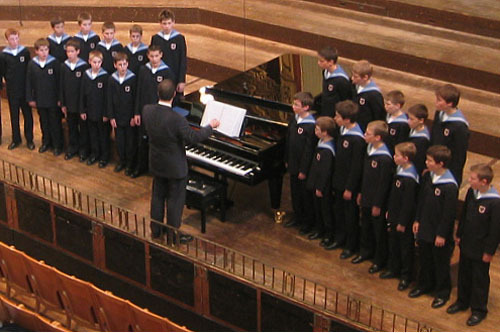 Time your visit to coincide with a performance from the Vienna Boys Choir. 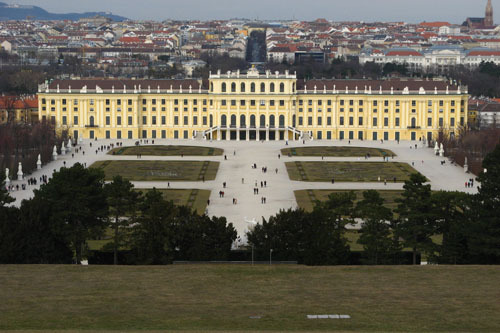 The city's highlights include the Spanish Riding School, Schonbrunn Palace and the Museum Quarter. Be sure to stop at the Naschmarkt for some local treats, and enjoy the chocolate rush while savoring a slice of sacher torte. Enjoy the magic of a Mozart concert, “golden sound in the golden hall” by the Vienna Mozart Orchestra in one of the finest music venues in the world. The hall’s rectangular shape, hollow spaces under its wooden floor and a number of other factors add to the special acoustics of the hall. Check the website for concert timings. 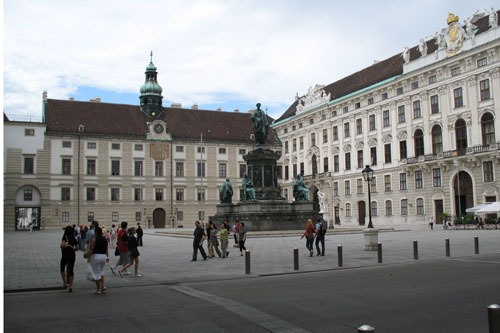 The Hofburg complex is made up of 10 buildings which truly reflect the splendour of the mighty Habsburg monarchy. The palace was host to numerous historical events, including the birth of Marie Antoinette, and in April 1938, when Adolf Hitler annexed Austria to Germany. Today, visitors can be easily overwhelmed by the sheer size and splendour of the complex. 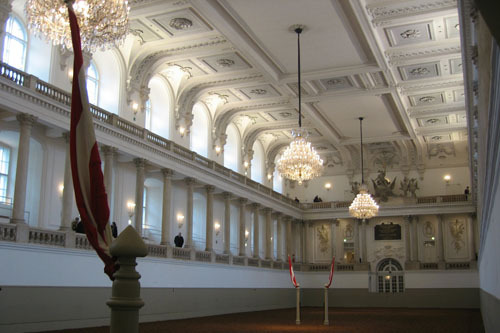 Most popular are the Schatzkammer (Imperial Treasury), the reading room of the Nationalbibliothek (National Library), the Kaiserappartements (Emperor’s Apartments), the Sisi Museum (personal effects of the Empress Elisabeth) and the dancing white Lippizaner horses of the Spanische Hofreitschule (Spanish Riding School). If you’re there on a Sunday, the Wiener Sängerknaben (Vienna Boys’ Choir) takes part in mass at the Hofmusikkapelle. If you don’t have time for a full tour of the museum itself, walk through the Hofburg Garden, since the fountains, greenery and flowers are truly breathtaking. Here you will find a number of items for which the word ‘priceless’ is truly appropriate. Divided into secular and ecclesiastical sections, the sheer volume of the exhibitions is overwhelming; add to this the fact that most of the information on display is in German, and visitors will appreciate the audioguide or a guidebook. The Ecclesiastical Collection includes the nail that is supposed to have pierced Christ’s right hand, the so-called ‘Spear of Destiny’, a piece of the cross on which Jesus was crucified, a tooth from John the Baptist, a piece of the tablecloth used at the Last Supper and – its most famous item - the Agate Bowl, which at one time was thought to be the legendary Holy Grail. 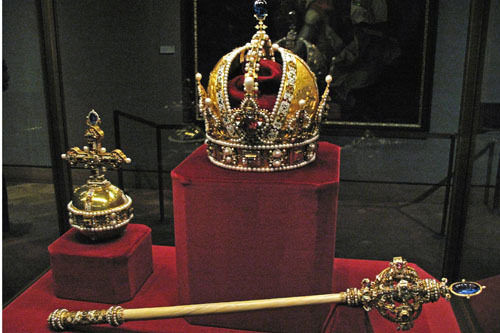 The Secular Treasury houses medieval royal objects such as the Crown Jewels, including the Imperial Crown and – here’s one for the ladies! - the world's largest emerald. The Musikverein ("music club") is Vienna's premiere concert hall featuring daily evening offerings from the city's best known orchestras. 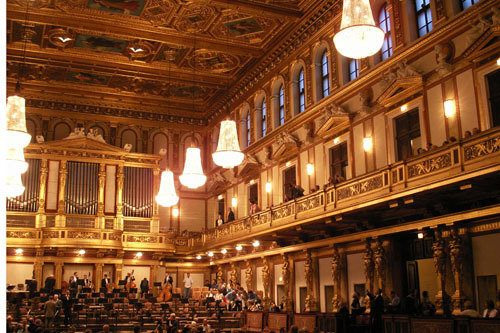 Home to the Vienna Philharmonic and renowned for its acoustics, the hall is considered one of the world's finest music venues. The structure was built in 1870 by the Society of Friends of Music on land donated by Emperor Franz Joseph. It houses five auditoriums including the famous 1,744-seat Goldener Saal (Golden Hall). The MuseumsQuartier, in the heart of Vienna, was created around the renovated royal stables built in the early 18th century. The 60,000 square meter complex comprises both ancient baroque buildings as well as spectacular modern constructions. 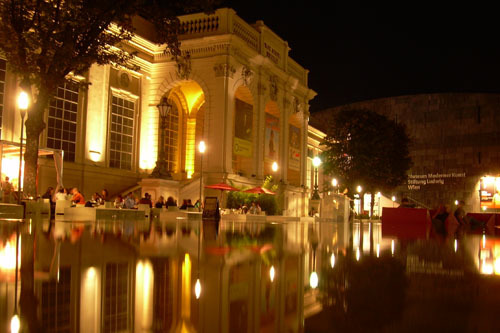 It houses large art galleries like the Leopold Museum (Viennese Expressionist and Modern Art), Zoom (interactive children's museum), Az W (architecture museum), Ludwig Foundation Vienna as well as exhibition spaces such as the KUNSTHALLE wien. Bars, shops, bookstores and artists' studios abound. It's at least one day's worth of museum exploration. This baroque edifice, once the summer home of the ruling Habsburgs, is Vienna's No. 1 tourist attraction. A UNESCO World Heritage site, the palace comprises an ornate park, zoo, statues and fountains. The Baroque layout of the gardens is very much as it was during the time of Empress Maria Theresa although she ordered serveral additons during the last decade of her life. According to legend, the palace built in the mid 1700s, got its name from the Fair Spring (Schönner Brunnen) which Emperor Matthias discovered in 1612 during a hunting expedition. The Spanish Riding School has been entertaining visitors to Vienna for the past 400 years. Founded in 1572, the institution has been practising haute école classical dressage longer than any other riding academy. The grey Lipizzaners, whose bloodlines date back to the 16th century in present-day Slovenia, execute their stylish synchronized routines up to eight times a month in the Vienna Imperial Palace Hofburg. The superb baroque manège where they perform was commissioned in the 1700s by Emperor Karl VI. Tickets are also available to see the grey Lipizzaner stallions being schooled most mornings in the grand manège. Stretching 1.5km along the river Wien and following the course of the Wienzeile thoroughfare, Vienna’s Naschmarkt is an Austrian institution. Its origins were in the 16th century, when the area was the city’s milk market; by 1793 it had grown into a vast fruit and vegetable market. Today a hotchpodge of food is sold from thousands of stalls, intermingled with occasional traders peddling cheap or ethnic clothing, and hand-crafted jewellery. On Saturday there is a flea market at one end; rummage among the second-hand garments for vintage bargains and search through the old, often tatty furniture for a rare antique. The multinational organic produce on sale here is legendary: stock up on specialty tortes, breads, local cheeses, fish, great slabs of meat, fresh fruit and piles of vegetables. Some of the stall holders can be extremely pushy, so take your bartering head with you. If you sample what’s on offer, you may be expected to buy. The restaurants and food stalls scattered throughout the market offer foods from all over the world: sushi, kebabs, falafels, curry, noodles, pizza, and Viennese Apfelstrudel. The best day to visit is Saturday, when the market is jumping at lunchtime, the cafés and bars are full and the atmosphere is of riotous good bonhomie. 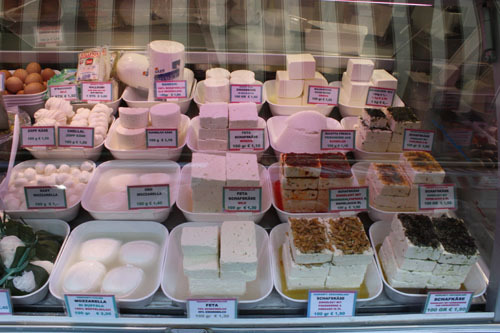 Try an organized food tour of the market, check the website link for details. The world famous Vienna Boys Choir was founded in 1498 by Emperor Maximilian I, who commissioned them for private masses and concerts for dignitaries and valued guests. After the 1918 collapse of the Habsburg Empire, the state took over many musical aspects of the country, but rejected the Boys Choir, so a private sponsor stepped in. When money became tight, he organized public concerts. They were surprisingly successful, so the Boys began to perform enthusiastically in public, and continue to do so to this day. At present, there are four choirs, who constantly tour the world. The choristers are from 11 to 14 years of age, they must attend school together and all receive a gold-standard musical education. Their concerts are usually sold out as soon as tickets hit the box office, but if you drop by Sunday mass at the Hofmusikkapelle (at the Hofburg Palace), you will be able to hear them sing.